Palace Hotel, Market Street, San Francisco, CA. 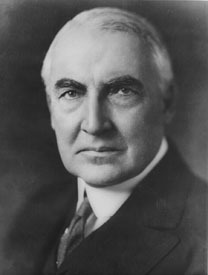 It is known with certainty that Harding suffered from pneumonia when he died, but the "diagnosis" of heart attack was guesswork done years later. See John Dean, Warren G. Harding (2004), page 139: "Years later, medical experts concluded that Harding's flu attack had likely been accompanied by an undiagnosed heart attack." Contemporary reports even attribute his death to that of a stroke, several newspapers quoting the medical bulletin: "a brain evolvement, probably an apoplexy."